The 2018 MWPBA Annual General Meeting (AGM) was held on November 3, 2018, at 1:00pm at The Scottish Home, 28th & Des Plaines Ave., North Riverside, IL. The meeting was also successfully webcast on a live stream on the MWPBA Facebook page. The results of the MWPBA band and solo contests at the 2018 St Louis Scottish Games and Cultural Festival on Friday and Saturday, September 28/29 are now available (band results, solo results). 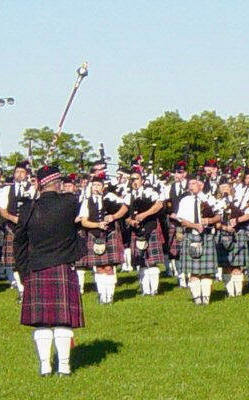 The St. Louis Scottish Games are rapidly approaching; this event is spread out over two days. Like 2017, the solo piping competition for Open players will take place on 9/28, Friday night at Dressel's Public House, starting at 4:00 p.m. The event will start off with piobaireachd at 4:00, and light music (6/8 March, Hornpipe/Jig, March/Strathspey/Reel) to follow at approximately 7:00 p.m. There is no admission charge, and we encourage bands and soloists that are coming to St. Louis for the Highland Games on Friday to stop by Dressel's and watch the open competition! The order of play for the will be published shortly.